Looking for something spectacular to do on your next trip to New York City? If you haven’t seen one of the world’s most famous musicals yet – it’s crunch time! 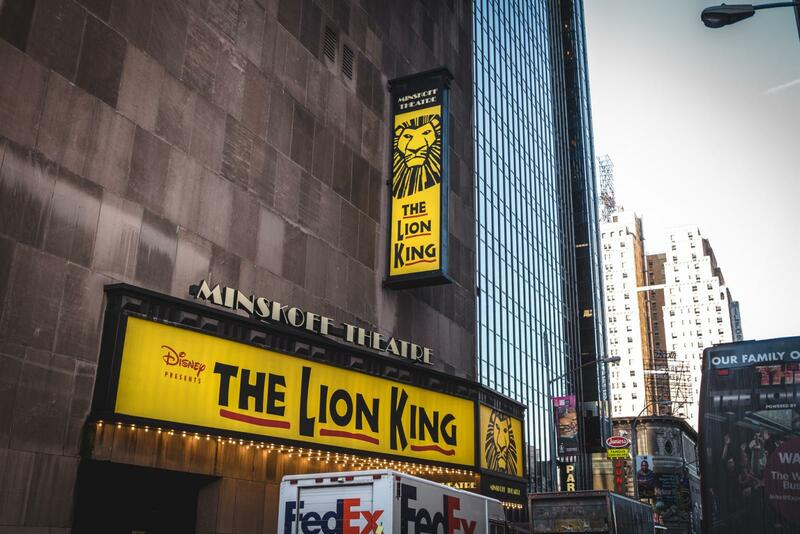 The Lion King on Broadway is waiting for you. The beautiful story of the lion Simba is based on a Disney movie from the 1990s which was re-interpreted by director-designer Julie Taymor. With breath-taking music, detailed costumes and amazing stage scenery The Lion King Musical takes you on a journey into the kingdom of lions, which is depicted by a colorful world of animals and nature. The Lion King on Broadway explores the circle of life, the principles of courage, fear and the meaning of life from the eyes of the inhabitants of the African kingdom. You will be carried away into the magical world of the Lion King Musical and watch genius life-sized animal figures and stunning costumes wandering through the aisles of the audience. The brilliant puppeteers will make you believe the roaring lions and circling vultures are real. The upbeat music is expanded with emotionally charged African rhythms and perfectly synchronized movements of the dancers. The Lion King Musical creates a spectacular ambiance with talented actors and musicians and an impressive orchestra which are all convincing factors making it one of the best musicals of the world. We recommend getting your tickets before you come to New York City. It’s safe, simple and definitely most comfortable to buy the musical tickets online. The Lion King Musical is often sold out or only seats with limited views are available for purchase. Therefore make sure you save the best seats in the Minskoff Theatre for yourself for an unforgettable experience in New York! Is the Lion King Musical something for me? The answer is simple: YES. The Lion King Musical is something suitable for both younger and older generations, so children will love it as much as adults. The music enchants the entire audience and makes you sing, jiggle your foot and experience goosebumps when you hear the first melody. The Lion King New York City is something not to be missed!